Thank you for your interest in Wholesale Warranties! We offer Extended Warranty coverage for all RV’s, so whether it’s your motorhome, pop-up, 5th wheel, or travel trailer, we’ve got a plan to suit your home-on-wheels. RVs have a very high chance of breakdown, and there’s no more stressful situation than having your vacation or road trip interrupted by mechanical repairs. Even worse? Using your travel budget to pay for them. 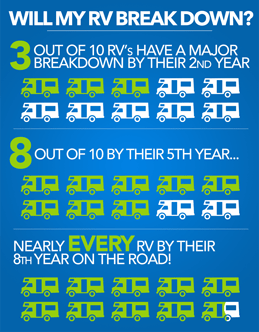 RVs break down more often than you might think, and when they do, it will cost you! RV Warranties step in to pay for these costly repairs, getting you back on the road where you belong. There are a range of coverage and deductible options available to you through Wholesale Warranties, allowing you to choose the policy that best fits your RV lifestyle. Our commitment to customer service excellence has led to our A+ rating on BBB and 5-Star rating on CustomerLobby. We only offer RV Warranty Policies that have proven positive customer service, affordable pricing, and guaranteed coverage. Owning an RV can already be a lot of work, so let us take the stress out finding the right RV Extended Warranty coverage for your vehicle. Fill out our online quote form below, and one of our knowledgeable Warranty Specialists will reach out to you in no time with more information! This is a textable number and I agree to receive information and updates via SMS text. This is a landline and/or I do not wish to receive information via SMS text. Please SelectYesNoThis is a potential purchase. Where did you purchase your vehicle?